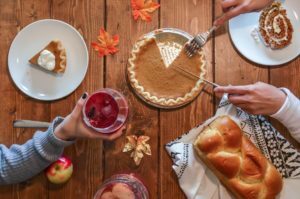 As we approach Thanksgiving Day and all the fall festivities taking place this weekend, we can find many reasons to be filled with gratitude. The bountiful harvest that will contribute to our Thanksgiving meal. The opportunity to connect with our local farmers and community at the Farmer’s Market while we gather our ingredients. The time spent with family and friends. What if we aren’t feeling so grateful? What if we are missing a special person or persons from our table? What if our grief reactions are making it difficult to even think about getting up and dressed for the day? We understand that in the midst of grief, we can often feel very isolated and intensely saddened. Finding gratitude may seem like one more challenge to add to a very long and trying day. Perhaps this year, we can find a glimmer of gratitude for our breath. For the fact that we’ve survived another night, to awaken in the morning. Perhaps we can find solace in the smile of a stranger, who has no idea how much our hearts are breaking. They often say healing comes with time, and that may be true. I think it is fairer to say that gratitude comes with time. As we move forward in integrating our loss into our lives, we can reflect with a different perspective on the events and memories of the past. We can find gratitude for time spent with the deceased. We can find gratitude from memories of those who surrounded us during our loss and who continue to be part of our days. We can find gratitude that we’ve found a way to keep something of that person with us – the sound of their voice in our heads, a meaningful note or letter, an oft recited quote or lesson. 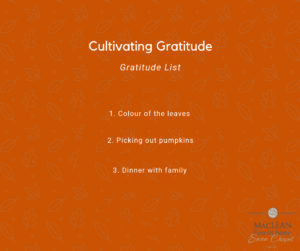 When we take the time to really think about what we are grateful for, the list can multiply quite quickly. Much like the harvest Island farmers are reaping, we too need to cultivate something to harvest. One of the simplest tasks is start a practice of keeping a gratitude list or journal. Start with a short list. Name three things you are grateful for. What we need to find most is gratitude for ourselves. We need to take the time to care and nurture ourselves. This Thanksgiving weekend be sure to carve out some time to do something just for yourself. I know you’ll find me hiking the trail at Long Pond in the National Park.